NEW LOW LOW PRICE!! 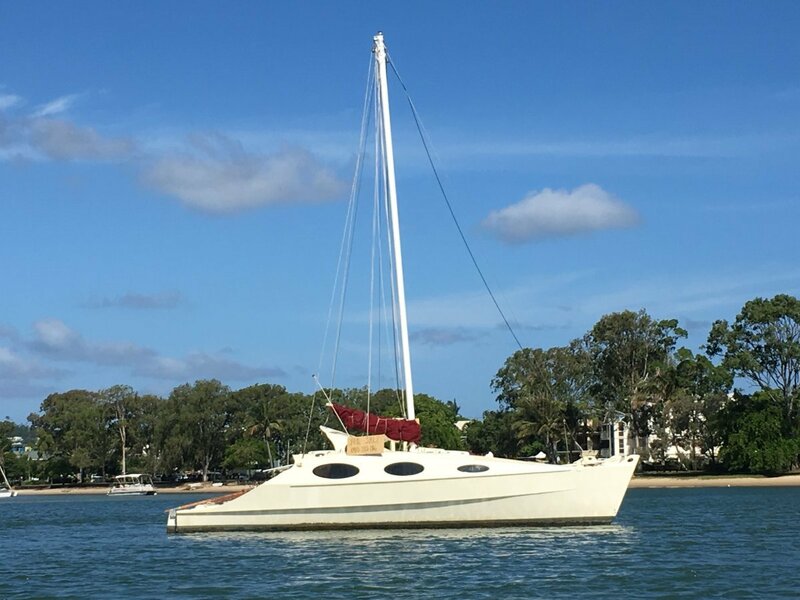 - SIMPSON 30 CATAMARAN TIKI RIG, READY TO SAIL AND PRICED TO SELL - NO OTHER BOAT ON THE MARKET THIS GOOD AT THIS PRICE - new 2018 9.9 high thrust Yamaha motor with 20 hours, autopilot, 2 double size beds, metho cooker, solar power, navigation system, 3 good sails and rigging, tender included, compost toilet, plenty of storage, easy layout. Ready to go. Recently returned from 4-month sail up the Queensland coast. Lived on for past 3 years, Ideal for a single person to sail, perfect for a couple. Low draw makes it easy to explore rivers, lakes, the whole coast - go where others can't. Only reason for sale is acquired a new boat that can accommodate our larger family. Anchored in the Noosa River - Give us a call and come check her out. Good condition, Sails beautifully, ready to go - perfect for a solo sail or a couple.